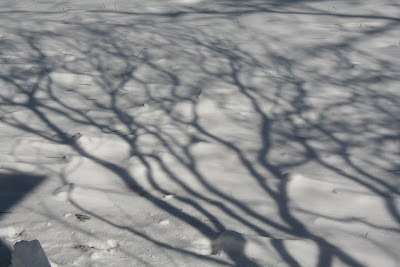 Off to western Massachusetts for the favorite gallery tour and swimming in the snow. R has work--so we are piling on--and doing the Q. tour of the galleries while he has to do the serious looking, comparing and notetaking. Going to galleries with me is more like going to the park--we laugh, joke and talk loudly about all around us. Sometimes we even learn something. We drink coffee and tea. We buy stuff at the gift shop (often more than the requisite tee). So, the plan is--first thing Monday to drive to Beacon, New York to see Dia Beacon. Very serious. Very grown up. Very blue cheese. My contingency needs a little push to get started with this stuff...but how to resist humongous sculpture, repetitious art and stuff made from single strands of colored string. There is a Warhol show. What is not to love? Pittsburgh's honored son, graduate of the same institution as their parents? Lots of color? They have gotten into it--and will. Then, back in the wonderbus, and we drive north with a break in Williamstown at the wonderful Clark (albeit it sounds like they have a pretty insipid selection of shows: Claude Lorraine, and a photography show on Ruins in Photography). The photography could be a player with the younger set. And their general collection is great. I think italian renaissance and some gory saints might keep them amused. Then, to finalize the day at MassMoca with two overnights at Porches. We will frolic in the pool and hot tub (out in the snow), eat breakfast and loiter amusingly until Moca opens at 11. R will be hard at work. Then, we will do Moca for the afternoon with lunch. There are a good grouping of shows (and lets not forget the shows in the kid's area which can be fabulous). More swimming outside, more saunas inside...its kind of continual. Then home via the Norman Rockwell Museum, one of the world's centers for illustration. They have a show on health related illustration and 323 Saturday Evening Post Covers on show. That should be worth the detour. My hope was to visit the Eric Carle Museum of Picture Book Art...but I think this will happen another day. Photo is from the Luckystone Lodge yesterday. Great drifts of snow with blue purple shadows. More geese and swans. Great blue sky.